So first off, I apologize for the graininess of these photos - thus the heavier hand in editing. 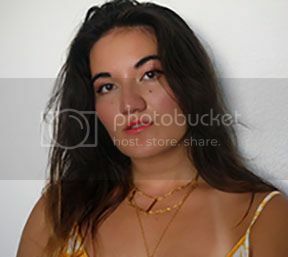 Normally I wouldn't post these, but the story that accompanies them wouldn't be genuine if I didn't include the actual photos that came from it. On Sunday night, I came back from work and changed into an outfit I was planning on wearing later that week and decided to get some photos done while I had free time. I changed, grabbed my phone and wallet, and headed out the door, automatically locking the door behind me. I was halfway down the stairs when it hit me: Did I grab my keys? Frantically I patted down my pockets, and when they came up empty, I realized my predicament - I was locked out. Thank goodness I had my phone on me! I was able to call my parents and they helped me break back in. The irony of it was, I hadn't really been locked out. I'd stood there jiggling and banging against the door the whole time before they drove over, but when dad walked up, he just gave it a good push and swish. The door opened. SERIOUSLY?? So now I've got three spare keys made. By the time the commotion had died down, I'd lost most of the valuable sun I'd been hoping to use. I really like this outfit though, and it's probably the last chance I'll have to show bare legs. Winter is coming! Thanks to Our World Boutique, I was finally able to jump on the camouflage print bandwagon with the blouse they sent me. I love the studded embellishments on it too (of course, you had to see that coming). Plus, this necklace is the perfect match with it! And I know I'm starting to overwear this beanie, but I just can't help it. It's seriously the perfect touch to every outfit. 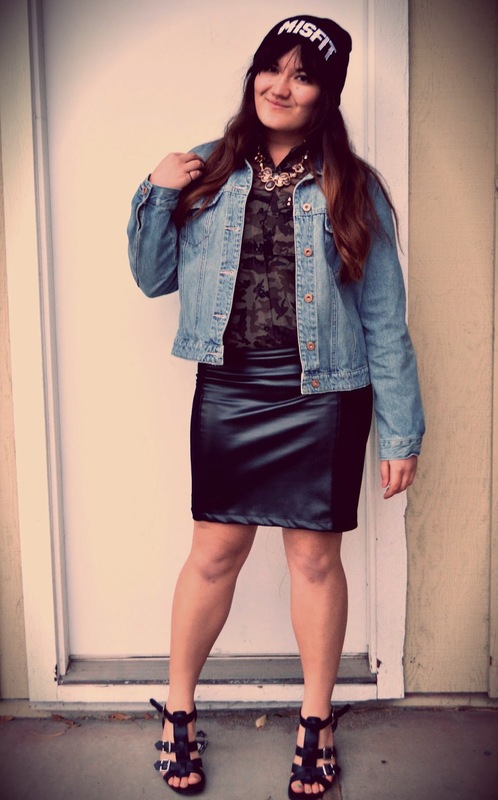 So cool this outfit - a perfect mix of grunge and feminine touches! Well put together. There is nothing worse than being locked out! I'm glad it was easy for you to find your way back in! Thank goodness for Dads! You look absolutely stunning. I LOVE the camo with the leather, and the beanie is just so perfectly, Linda. LOVE it!! what an awesome skirt, Linda! Fits you prfectly well! 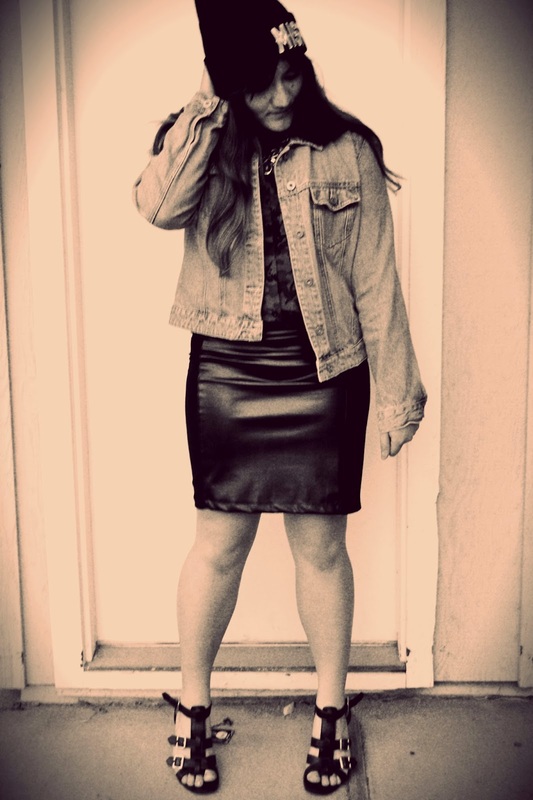 You look great and edgy, as always:) Thank You for sharing such a nice post! camo print!! LOVE your top dear! the studs are amazing details!!! i really like how you wore it with denim jacket and leather skirt!!! really chic Linda!! omg, that would been a nerve-wracking situation! thank God your parents came immediately :) btw, the photos are still good to look at! looking rough edgy chic with that camouflage top! The sheer and the gold are nice, feminine touches to soften the camo. And your legs look so wonderful here, dear :) Cute little chapeau as well! I love your look specially your leather skirt! STUNNING! my fave is the beanie! i love how you paired it with the camo.. i need one of those! I am not a fan of the camo trend. It reminds me of hillbillies? But that's probably because that's the only kind of person who wears it in Ohio...anyways, I think you rock it nicely and make it edgy/chic. I am still, however, swooning for this hat! Oh, you lucky gal... The days of bare legs have long ended here, damn you winter! :) Thumbs up for the camo and definitely thumbs up for the misfit hat, I want that!! Oh, no! I've been locked out too many times to count (because I'm careless and always forget my keys haha) so I know the feeling. Glad you were able to get in though! I used to hate the camo trend, but I'm starting to like it more and more when I see it on classy pieces like this. You totally make it work, and I love how it looks with that skirt and necklace! wonderful, wonderful, wonderful. I love the pairing of casual cameo with a seriously classy skirt. And such a perfect statement necklace! by the way, sounds like a typical Murphy's law, this story with your keys. Great outfit, super original and cool! I love how editorial your posts are becoming! I've always been drawn to blogs that put that extra effort into photo processing and presentation. You could probably trade in the sandals for boots and be set for the lower temperatures. Seriously love your skirt and heels! 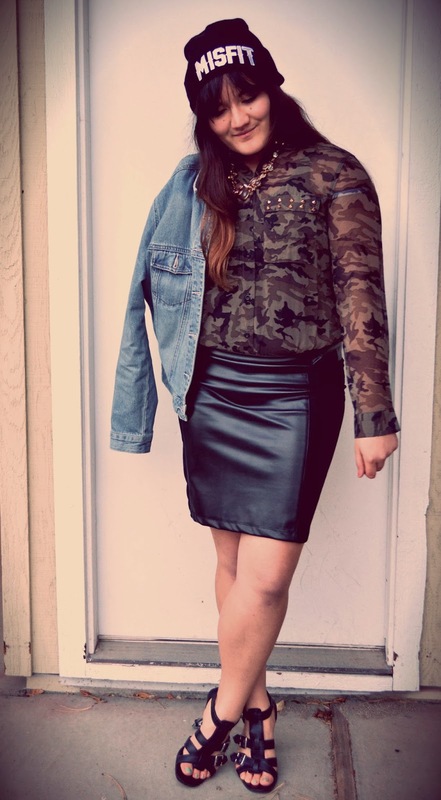 I love the camo blouse, this edgy outfit is awesome! And I'm glad you got spare keys so you won't be locked out again :) But man, that must have been such a surprise when the door just opened, haha. loving that camo top, looks gorgeous! Oh Linda I love the camo trend, like so obsessed :) I adore your take on it with the denim and misfit beanie..effin cool beanie! I love the military, street-style vibe to it! :D You look just fabulous! Thankfully you got in and nothing was damaged. I think this happens to a lot of us. What we do is give a spare key to a good friend or neighbour just in case. 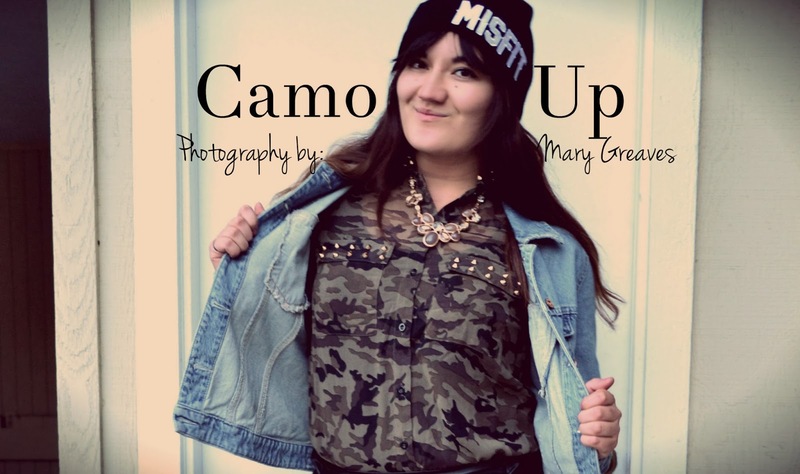 Loving this urban chic outfit, its an exciting new way to style camo, Adorable beanie. I hope you have an inspiring week ahead doll! So cute, I love that skirt. In LOVE with your shirt.... so cool!!! This is such a cute look to wear going out. I love that skirt on you! The pictures look great and I love the camo shirt with the denim jacket. It casual chic. I love camo and black together! You look fierce. hi dear friend,Linda B!!! Baby Z got to go home today!!!! My 1dd is so happy, excited, releaved and all of the above. I love that we are having mellow autumn temps in our neck of the woods, huh? You look so cute in this ensemble. I LOVE YOUR HAT! I've got a Giveaway rolling. enter! Hey Linda, I just wanted to stop by, I hope all of your family down in the Philippines is safe and well after that horriable storm. You look beautiful! I love this look and what a cute blouse! And I swear, dads can fix anything! Haha Linda--that sounds like something I would do! I'm glad that you got that little mishap sorted out and that you got some photos in. This edgy look is so you--the camo with the baubles is genius! And as for your previous post, I found it too cute that your art teacher set you and Mr. Scruffy up. So precious! And I almost squealed when I read that you two are dating now! Yay Linda!! Have a beautiful week, girl! You seriously rock came like no other, this shirt is awesome! Also, the story sounds like a summary of my every day life, seriously. Can't go wrong with camo! I love this look! Love this camo blouse! I feel like your style has gotten super edgy, I love it!